We consider the problems of maintaining approximate maximum matching and minimum vertex cover in a dynamic graph. Starting with the seminal work of Onak and Rubinfeld [STOC 2010], this problem has received significant attention in recent years. Very recently, extending the framework of Baswana, Gupta and Sen [FOCS 2011], Solomon [FOCS 2016] gave a randomized 2-approximation dynamic algorithm for this problem that has amortized update time of O(1) with high probability. We consider the natural open question of derandomizing this result. 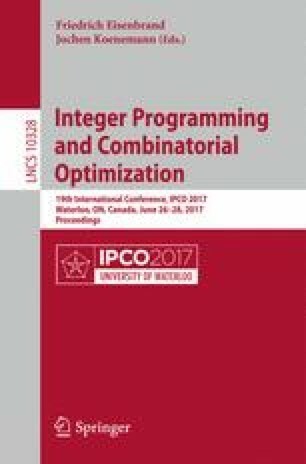 We present a new deterministic fully dynamic algorithm that maintains a O(1)-approximate minimum vertex cover and maximum fractional matching, with an amortized update time of O(1). Previously, the best deterministic algorithm for this problem was due to Bhattacharya, Henzinger and Italiano [SODA 2015]; it had an approximation ratio of \((2+\epsilon )\) and an amortized update time of \(O(\log n/\epsilon ^2)\). Our result can be generalized to give a fully dynamic \(O(f^3)\)-approximation algorithm with \(O(f^2)\) amortized update time for the hypergraph vertex cover and fractional matching problems, where every hyperedge has at most f vertices. D. Chakrabarty—Work done while the author was at Microsoft Research, India. M. Henzinger—The research leading to these results has received funding from the European Research Council under the European Union’s Seventh Framework Programme (FP7/2007-2013)/ERC Grant Agreement number 340506.